Awarded #1 - Tennessee's Best Corn Maze. "Worth the drive...my boys love getting lost in the maze! "Sam H.
Fun things to do in Nashville and around Middle TN this fall means a visit to Lucky Ladd's Corn Maze. Named as "Tennessee's #1 Corn Maze" in 2017 and 2018, each year is a new challenge as we design a brand new maze for you to explore in the cornfield. 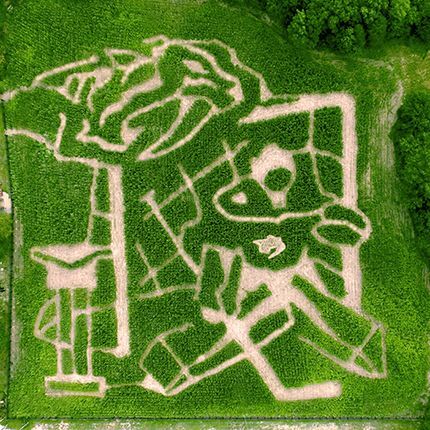 In 2018 guests loved getting lost as they traveled through miles of winding paths in our corn maze that paid tribute to the 2018 Central Division Champion Nashville Predators. Get Tickets and Get Lost! - 2019 Ticket Sales Open Soon. The Corn Maze features three fun games to enhance your experience including "Animal Tracks," "Farm Treasure Hunt" and our "Maze Master Challenge." Play one or all three! Adult supervision required for children under age 12. There is a $750 fine for any damage / vandalism caused to the corn maze or farm property.